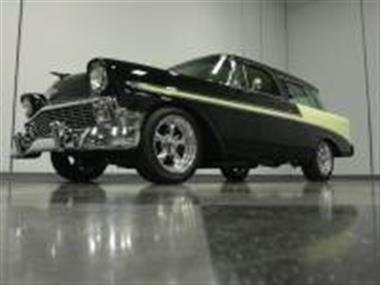 Is the Chevy Nomad the ultimate wagon? There surely arent many that are more handsome or desirable than this beautiful 1956 Nomadand#44; and despite those two stylish doorsand#44; its still a practical hauler when it needs to be. With a built 350and#44; an overdrive transmissionand#44; all the modern conveniences on this frame-off restorationand#44; theres no better way to haul your stuff home from the store than this.<br /> <br /> Of the Tri-Five Chevysand#44; the 56 best combines flash and understatementand#44; particularly with two-tone Bel Air trim. The inky black paint works quite well with the light yellow contrast panel to highlight that dramatic line that runs from nose to tailand#44; giving even the utilitarian Nomad a very sporting look. Befitting a car of this caliberand#44; the paint and bodywork are very nicely doneand#44; offering great gaps and alignmentand#44; as well as a shiny final finish thats the direct result of many hours of hand-rubbing and buffing. 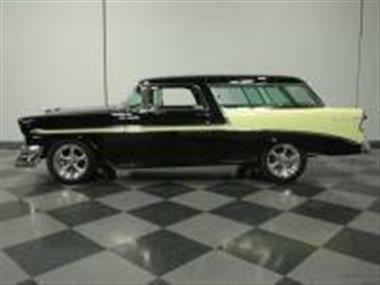 Classic Nomad styling details like the ribbed top over the rear cargo areaand#44; the chrome rub strips on the tailgateand#44; and the wrap-around rear side windows are all a big part of the Nomads appeal. All the chrome and trim has been freshened (and theres a lot of it) making the car sparkle in the sunlight. Tinted windows and a slightly lowered stance gives away the secret that this isnt just a fully restored trailer queenand#44; but that doesnt make it any less appealing. 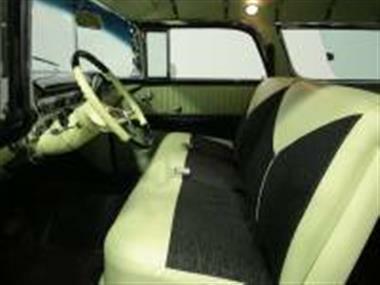 In factand#44; the upgrades it does have only add to the driving experienceand#44; making this the Nomad you buy to drive from car show to car show.<br /> <br /> Keeping the interior stock was obviously one of the builders objectivesand#44; so the factory bench seats remain in placeand#44; neatly wrapped in period black and yellow upholstery that works perfectly with the exterior color combination. The original dash was color-matched to the bodywork and fresh gauges from Classic Instruments are in place in a single sweeping pod ahead of the very trick custom steering wheel that looks stock but carries a fatter rim. You willand#44; howeverand#44; notice that the shifter indicator on the column includes overdrive and it tilts to make it easy to get comfortable behind the wheel. 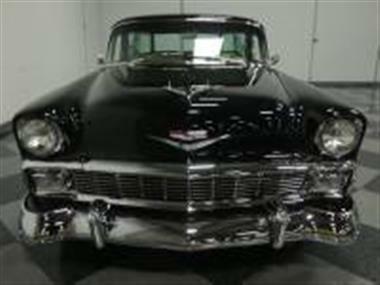 Theres an AM/FM stereo head unit in the center of the dash and a brand new Classic Auto Air A/C system discreetly installed underneathand#44; making this a fabulous long-range cruiser. 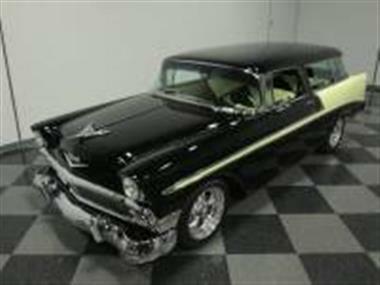 The cargo area is carpeted with the same lush black weave as the rest of the car and it almost seems a shame to carry gear back there and risk getting it dirty.<br /> <br /> The engine is a built and beautiful 350 cubic inch V8. Bored .040 oversize and topped by a Holley 4-barrel carburetorand#44; it moves the Nomad easily. 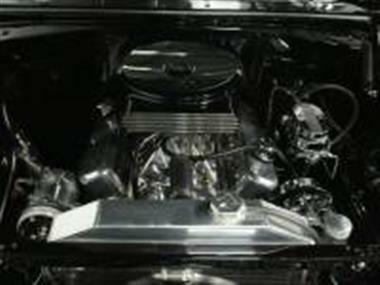 Other upgrades include a polished high-rise intake manifoldand#44; Mallory Unilite ignition systemand#44; long-tube headersand#44; and lots of polished aluminum and gloss black paint. That cool air cleaner has a high-tech look and the custom aluminum radiator tucks into the original slot up front. Power rack-and-pinion steering and front disc brakes with a dual reservoir master cylinder improve safetyand#44; and the aforementioned 700R4 4-speed automatic overdrive transmission makes for easy highway driving. Long-tube headers feed a custom stainless dual exhaust system with a nice mellow toneand#44; and while there arent any major mods underneathand#44; its incredibly clean and well-detailed. Torque Thrust wheels are a perennial favorite and look right on the vintage Nomadand#44; even wearing modern Continental rubber.<br /> <br /> Theres a very good argument to be made for the Nomads position as greatest wagon of all timeand#44; and this 56 certainly makes for a compelling case study. Call today! 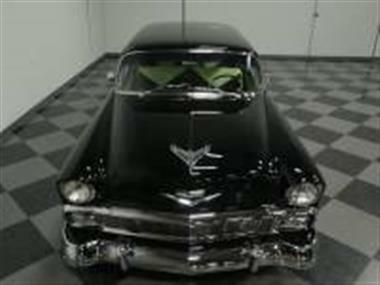 This vehicle is priced $28,248 more than the Average Market Price of $61,747 for a 1956 Chevrolet Nomad. This is a Poor Deal as it's priced 31.0 % above market avg. The Pie chart below shows the number of ads within different price ranges.